The Novotel Centrum is situated in the centre of the city, in the crossing of the Grand Boulevard and Rákóczi Street. The hotel consists of two wings: a renewed, protected wing and a modern extension, built in the Art Nouveau style. The hotel is only a few minutes from the cultural and commercial parts of the capital. The Novotel hotel offers 227 rooms on 6 floors. The rooms, furnished according to the latest Novotel style, are equipped with air-conditioning and heat- and sound insulation. All rooms have bathroom with bath (in the new wing with separate toilettes) and with balconies in the old wing. Three rooms provide total comfort for disabled guests with attached rooms for their companions. There are 12 connected rooms for families and 117 rooms for non-smokers. All bedrooms feature: spacious work and relaxation area, smoke detector, loop facility, safe, TV-radio sets with 24 satellite and 4 pay-film and 6 music channels and modem point. The restaurant offers dishes of both the French and Hungarian cuisine and a delicious breakfast-buffet. Permanent seasonal offers, excellent wine-selection, children's meal. 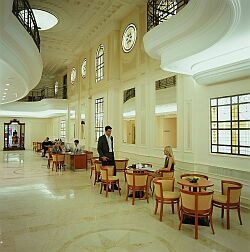 Lobby Bar offers alcoholic and soft mixed drinks, cakes, appetisers, coffee and tea. Well-equipped fitness room with jacuzzi, sauna, solarium, cardio and massages. Not far from the hotel in a nice park possibility of jogging. 5 air-conditioned meeting rooms approachable directly from the street, with a max. capacity of 400 persons. Full prepay price only applies for a reservation 0 days in advance. The room prices include the accommodation, but do NOT include the breakfast and the taxes. Two children under 16 years sharing the room with parents stay free of charge in extra beds. Novotel Budapest Centrum offers free WiFi Internet connection in all public areas and guest rooms.